A three-story building in Nigeria collapsed on Wednesday. The cause of the collapse has not yet been determined. Nigerian officials on Thursday halted search efforts a day after a school building collapsed in Lagos with an unknown number of children inside. The death toll was eight and could rise. As some anguished families protested and sifted through the rubble for any sign of their children, National Emergency Management Agency official Ibrahim Farinloye said workers had reached the foundation of the collapsed three-story building and did not expect to find more people. He declined to give an updated toll of dead and rescued. Officials late Wednesday said 37 people had been freed. An unknown number of people remained missing. Frantic efforts had gone into the night to find signs of life in the debris. 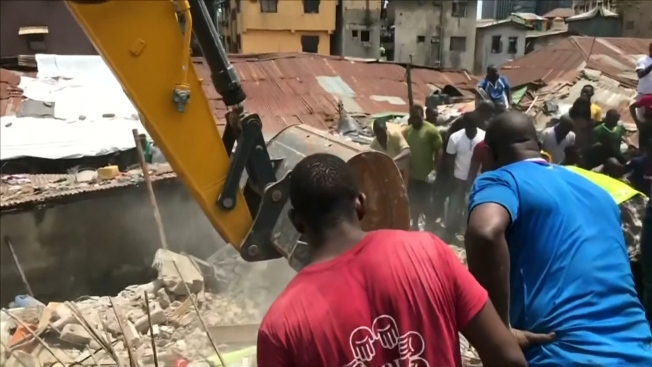 It was not yet known what caused the collapse of the building containing a school in a crowded neighborhood at the heart of Nigeria's commercial capital, Lagos. Lagos state Gov. Akinwunmi Ambode said the building, which had been marked for demolition, was classified as residential and the school was operating illegally on the top two floors. Official moved through the neighborhood on Thursday, marking other derelict buildings for demolition. Obiora Manafa with the Standards Organization of Nigeria told reporters that they would analyze samples of the collapsed building's concrete and steel bars "to ascertain the quality ... and know whether they complied with the national building code." A crowd of hundreds of people had cheered on Wednesday as dust-covered, shocked-looking children were carried out one by one. Other small bodies, however, hung limp over workers' shoulders. As many as 100 children had been in the primary school on the building's top floors, witnesses said. Some authorities disputed that, but all grieved. "It touches one to lose precious lives in any kind of mishap, particularly those so young and tender," Nigerian President Muhammadu Buhari said. The collapse came as Buhari, newly elected to a second term as president, tries to improve groaning, inefficient infrastructure in Africa's most populous nation.